In The Slave Ship Marcus Rediker demonstrates that slaving vessels were sites of transformation, where Ibos became Africans, ship captains became prison wardens and seamen became guards. These transformations were significant, both for the individuals on those ships as well as for the wider Atlantic world. But were all ships similarly places of transformation? Or was this a process unique to slave ships? 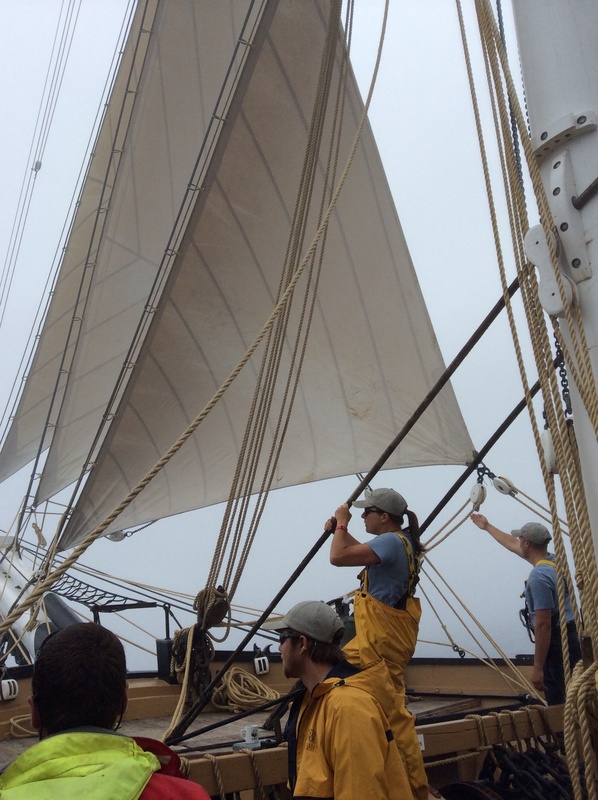 During the The Charles W. Morgan‘s recent voyage from Provincetown to Boston we sailed in fog for three hours. During this time only the sounds of the crew hauling line, officers barking orders, the fog horn and water lapping against the ship’s hull broke the silence. We could neither see land or much else. Each Voyager on the ship became largely disconnected from their lives on land. In a sense each became “maritime” in a way we were not before we had stepped aboard the ship. The experience made me think about the transformation 18th century runaway slaves underwent when they found berths on ships in order to flee their masters. How easy was it for fugitives to transform themselves into seamen and by what means did they do so? Five factors were crucial in runaways becoming mariners: prior maritime experience, use of boats or canoes to reach ships, change in clothing, war, and being able to convince ship captains they were capable of shipboard work. Large numbers of fugitive slaves seeking berths, individuals I characterize as “maritime fugitives,” already had maritime experience, either refitting ships or working on a vessel. These men’s movement onto ships while difficult — after all masters sought to recapture them and offered rewards for their return — was far easier than for those runaways lacking maritime experience. 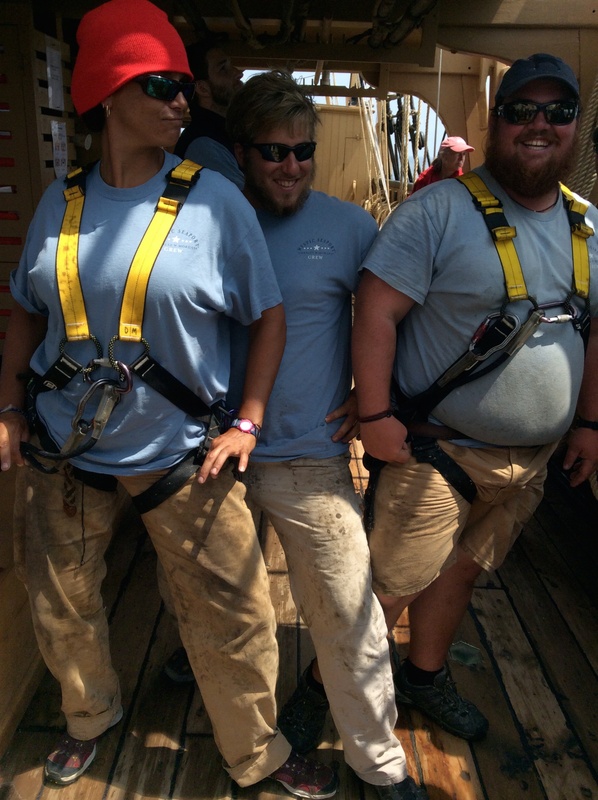 They knew the language of a ship and easily affected the distinctive walk and talk of a Jack Tar. Thus, when Will Johnston fled Captain Lemuel Jenkins’ Providence whaling ship in 1775 his knowledge of the cooper’s trade and experience on Jenkins’ whaling ship made him a prime candidate for a berth in any of the nearby New England ports. Unlike Will Johnston, many maritime fugitives did not live in ports. Fleeing countryside enslavement these runaways headed to waterside cities knowing ports offered them the opportunity to permanently disappear. 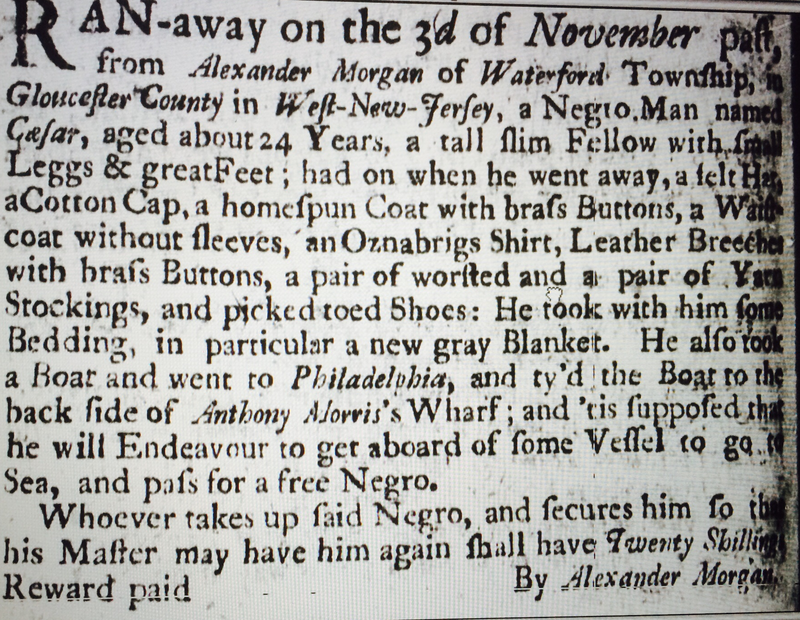 To avoid being stopped on roads many fugitives such as Ceaser, the subject of the below fugitive slave advertisement, used small boats and canoes to flee their master. Local rivers, streams and bays served as watery networks by which inland slaves in places such as Bucks County, Pennsylvania or Westchester County, New York reached major ports. Thus, the experience of becoming “maritime” in fact started for many runaways far from the busy docks of Philadelphia and New York. Having escaped their master, obtained a boat, reached a port and gotten rid of their ozenbrig clothing maritime fugitives still faced two critical hurdles: the vagrancies of maritime labor markets and the ability to convince ship captains of their capability on board. The critical role of war as effecting American maritime markets and the opportunities for maritime fugitives cannot be understated. There was a direct correlation between the size of maritime labor markets – which boomed during the many wars of the 18th century – and the number of maritime fugitives. Likewise, during post-war recessions, the numbers of maritime fugitives plummeted. The result was that the overwhelming majority of 18th century maritime fugitives fled during wartime. Even after arriving dockside a fugitive seeking a berth who lacked sea experience needed to be an effective salesmen. Or as the master of Jack, a Maryland enslaved waiter who in 1784 fled seeking a berth at sea observed, fugitives needed to be “artful fellow(s)” to convince ship masters that they were capable of working aboard a ship. This meant that few runaways who did not speak English were able to obtain berths. In future posts I will discuss the nature of black seamen’s lives in the 18th century. As always, your writing and research take me right to the time, people and places you write about. Is there a way to sign up for your blog so I’ll always know when there’s a new entry? Thanks. Ozenbrig is the Old Orange?